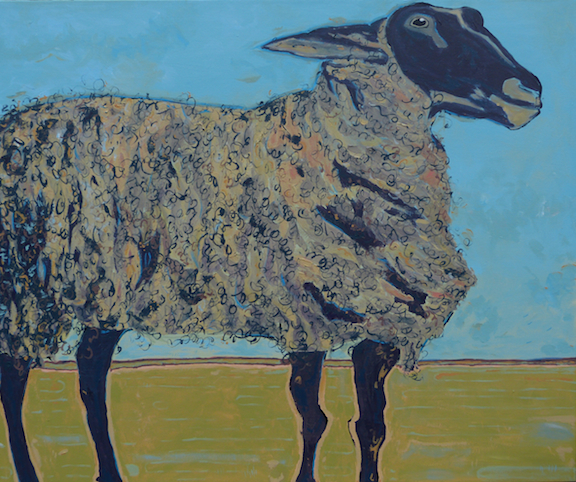 Bon voyage "Proud to be a Sheep"
This painting sold on Saturday to a mystery visitor to Palms Coffee Shop, in Almonte. I sure was surprised by the blank space on the wall today. Sheep... enjoy your new home! New sheep owners: I'd love to hear from you! Sold 'em both at the Crown & Pumpkin tour 2012. There will be more like these - I love them! It was a great weekend - thanks Richard Skrobecki, potter & host (left), and Dave Card, sculptor & co-guest with me. Archive of paintings sold is up! In early 2012, this painting was chosen as the signature work for Mississippi Mills Bicycle Month, June 2012. The Millstone news published the full story. Thanks MMBM committee!